At the International Dogshow Groningen on March 2nd (NL) Rottrivers Dancing On My Own alias Pontus became Best Male. Judge was mrs. Birgitta Hasselgren from Sweden. With this win he also became Dutch Champion. 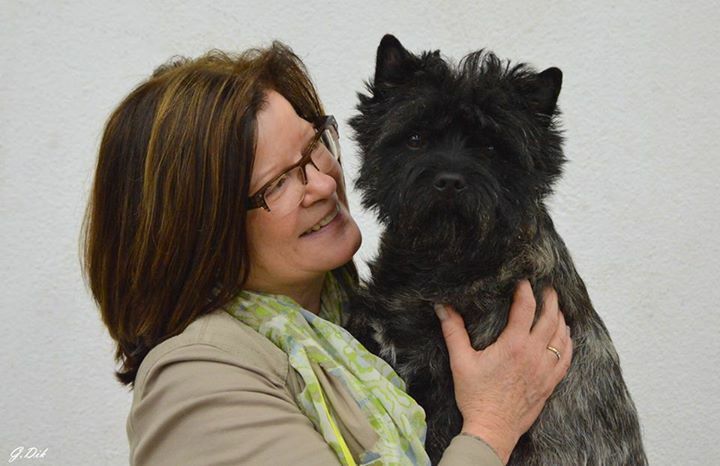 We are so happy for his owner Elena Sorokina from Cairn Terrier Kennel Iz Doma Eliv’s from Moskou and of course for his breeder Krister Ohlander-Lindblom from Kennel Rottrivers. Thank you, Christiane Wentzel Cairn Terrier Kennel Glenmore’s, for bringing Pontus in our lives and giving us your trust! This victory came just in time for Pontus is going home next week. But not straight away … He will be shown at Crufts Birmingham before he leaves to Moskou. One thing is for sure … we will miss this very special boy. But he will be remembered in his offspring by Red Creek Rebels Fabulous Flynn, Red Creek Rebels Russian Affaire, Red Creek Rebels Dutch Darling. We are sure that these puppies inherited many of his lovely qualities. Thank you Gerda Dik for the lovely picture!